An encourager will look past the immediate beauty that is clear to all who pass by, looking inward purposefully for the gem which they offer as a token of friendship and a promise of gladness. Sometimes, though, we are caught up in the flowery eloquence of the poet, who chooses words as their palette, to paint a picture for the entire world to see. Maybe, though, we need to be looking beyond the flattery for the intent of real investing from those whose sight searches beneath to the blueprint of our giftedness. An Encourager looks inward seeking a treasure to inspire you. Many times we are bound on all sides with negative, feeling ourselves pulled in that direction as a consistent weight upon the spirits; an unnecessary weight which is burdensome and heavy. It makes the bearer feel the continual loss, a sense of incompleteness. Sorrow of heart is an apt description of this negativity that we can impart to each other. It is somewhat contagious and deceiving because we sometimes feel like we are truly qualified to make bold statements, deliver judgments or list grievances. Do you ever feel like you are playing a game of tag and you are always IT? Or perhaps you feel like you are in a race and have been lapped continuously, like there is no way you will ever make it to the finish line? That is this place of heaviness which I am talking about. It is as if we are sitting at a feast, full of beautiful dishes with abundance on all sides, but are unable to partake of the goodness. Yet, God’s word directs us differently. I am learning by continually experiencing this path of purpose-filled living IN His grace, that we always have a choice, and, likewise, that choosing must involve my intentional action of encouraging, loving, and lifting up of those around me. Proverbs 15:15 – A glad heart has a continual feast. I can come to the feasting table and be hedged in by my own insecurities, creating a wall that everyone can see, and miss out on the abundance provided for me. OR I can come to the party, willing and ready to partake, lacking a need to please the hungry eyes I think are about to devour me by intentionally choosing to bless someone else. Gladness, I used to think, was a state of happiness achieved by the accumulation of friends, sometimes things, and unfortunately, praise of man. In my own, self-diagnosed illness of perfectionism, I allowed myself to hold back from the beauty of relational living because “I’ wasn’t quite good enough, or perhaps, I didn’t have ‘it’ all together. Whatever the ‘it ‘was, I was never totally sure of. I just knew I didn’t have it. Don’t let fear of others opinions hold you back from delivering a blessing. Be obedient to your DNA ( divine natural abilities) and operate in the gift of God in you … To be an ENCOURAGER. Joy and gladness are synonymous. As I have habitually come to the Word for my daily bread I have found that the only source of lasting joy is found basking in the Presence of the Lord. (Psalm 16:11) It is in Him, through Him, by Him that I am found perfected and completed for the task of relational living. (1 Thes. 5:23) In our dysfunctional state, (that place outside of Christ), we are always searching to fill the black-hole of needs in our life. Everything falls through the empty cavern, and the effort is continually thwarted, because no matter how hard I try … a square peg does not fit into a round hole. Proverbs 12:25 reminds us of the importance to reveal a heart of joy and gladness in our sphere of influence. “Anxiety in a man’s heart weighs it down, but an encouraging word makes it glad.” When I think of the encouragers in my life, the glad hearts that look for the hidden needle in my haystack heart, I realize they saw something I endeavored to keep hidden. They saw past the anxiety of the perfectionism which drove me and still loved the bare beating heart laying beneath the mounds of false ideas. Those unachievable goals which I thought were the mold I must place myself within to exist and thrive. It is clear that the boundaries I placed to protect myself actually robbed life out of my daily interactions and stole the passion from my purpose. Psalm 51:8 says, “ Make me hear joy and gladness”. I have to choose to hear the good. It is easy to listen to bad. To be honest, we ourselves are the carrying the biggest megaphone of criticism in our lives. I have to choose to hear the encouragement of others, whose love runs parallel to the journey into grace-land- living, exactly for what it is. It is a refining voice of purpose. Those Iron-sharpening- Iron friends who speak truth and love all woven together in a perfect package of warmth and compassion. Walking together as grace dwellers, camping in the Valley of Encouragement, we can lift the countenance of each weary traveler and, in so doing, fill our hearts in the process. We are not intended to live a life of solitary existence, but how do we shelter ourselves from the arrows of pain the un-loving so easily aim our way? We live as He did, and love as He loved and we intentionally give what we feel we ourselves are lacking. It is in giving that we will truly receive. YOU must become the encourager, friends. You must make the effort to speak love, truth, and gladness as a beautiful blanket to place upon the cold and weary soul in the mission field of your lives. Without His influence in our lives, however, that task is impossible. We can love, we can bless, we can encourage, and we can lift up, but without His perfect love and grace, there is always going to be an element of authenticity missing. When we love as Christ loves, we can be an Encourager without the false flattery that has no foundation. True encouragers offer gladness of heart. Their words and actions prepare a feast. Those who habitually bless in grace offer a meal of unending proportions. We can eat and be satisfied. In this way we add another layer of refining on the journey of living by sharpening and shining the soul both inside and out. Be filled with the hope which is abundant as we fellowship together in Him, so the spilling forth mirror’s the image of the giver. (Romans 10:13) As we are knit together In Christ, we become like Him in our actions. Like Christ, we can be the comforter and encourager we are all meant to be. 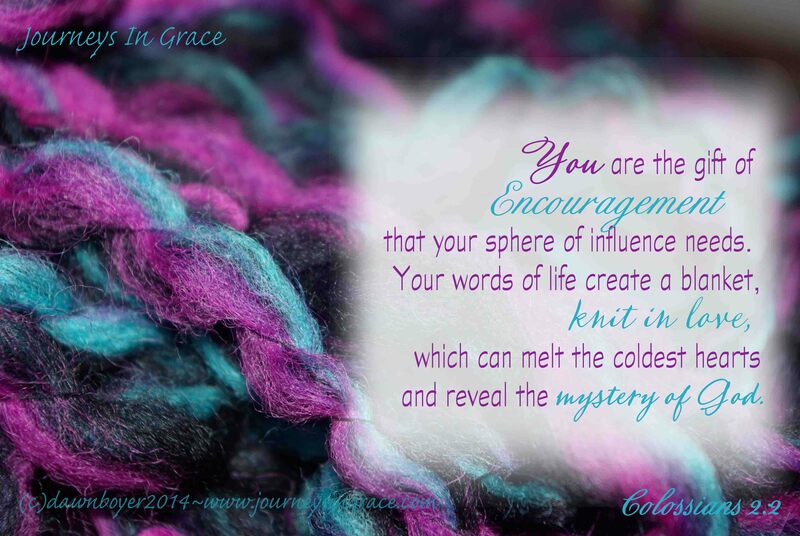 You are the Encouragement your sphere of influence needs. Your words of life create a blanket, knit in love, which covers the coldest heart and reveals the Mystery of God. Praying today you feel bold enough to step out in faith and ENCOURAGE those in your mission field. Linking up with Lyli atThought Provoking Thursday, Holley at Coffee for your Heart ,, and Jennifer at #TellHisStory. Take a journey to read the encouragement each of these grace-dwellers share from their Valley of Encouragement. *Images and content are the work of Dawn Boyer unless otherwise noted.(c)dawnboyer2014~www.journeysingrace.com. Rejoicing in the Journey of Faith~ Happy New Year! What if rest led you to pray big? your wiritng is very beautiful and very encouraging. As I was reading I thought about how I have actually been more of an encourager than the encouraged and that made me sad. I think there is a flip side sometimes where we can get so busy and so used to sowing into others that we don’t nourish or allow ourselves to be nourished. I am grateful that YAH has given me the grace to see that I too need to allow myself to be nurtured, uplifited, encouraged and nourished as it does take a lot to keep giving out without topping up again. Thanks for a beautiful post and thanks for visiting my blog. Thank you for kind encouraging words. 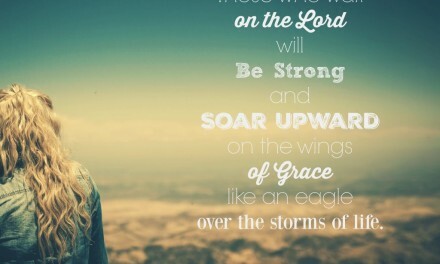 I am praying for the Lord to bring His perfect laborers into your life to encourage you and to lift you up. I have found that when I have gotten weary in the ‘well-doing’ that He is always ready to supply the abundance for my needs in ways I never could have imagined. I love that His plan is always better than mine. I am confidant that you are a blessing to all who know you. Your comment blessed me, thanks so much. Praying you hear only His heart towards you in all things, Lyli! Thanks for stopping by.